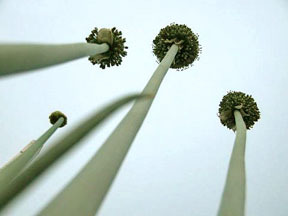 Ah, weeds. They can ruin a fine day in the garden. Fortuitous weed product. One misplaced ear sprouted and one quart of popcorn was the result. 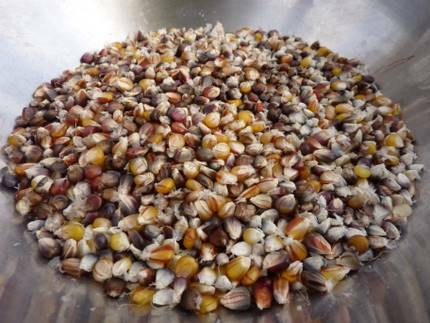 You should plant popcorn annually because it pops more readily when fresh. Somehow, though, I forgot to plant it this year…and the weed gods smiled on my oversight. For as little time as I have, weeding still remains a task of high importance. It’s funny to me, though, this one idea: my concept of “weed” is ever-changing. Sure, I always remove a dandelion when I see one, and dock , thistle and crabgrass never get a pass. But everything else? I have a sliding scale! The one thing that holds true with me is the my very definition of weed: it’s something growing where you do not want it to grow. But this mashup of little time and littler patience with the task of weeding has been a bit of a boon for a certain kind of weed in my garden. Volunteers, you see, have been granted stays of execution. The seedlings of plants from the year (or more) before that sprout, crazily, sometimes happily, near where their parent plant had grown. 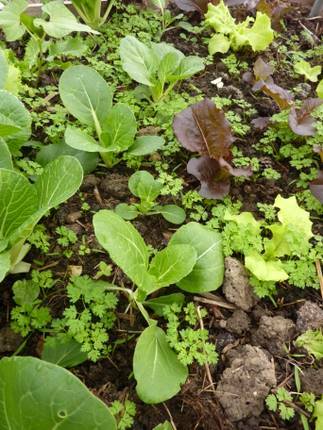 Chervil is a tiny herb, loving cool temperatures and disappearing in the hot months. 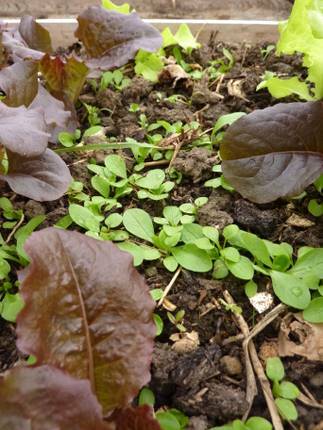 Though many, these seedlings won’t outcompete their mixed pac choy/lettuce neighbors in the winter greenhouse bed. Likewise, mache is another tiny plant that can cohabit with the greenhouse lettuces. It’s firmly in the never-need-to-plant-it-again category. Things are getting out of hand when I let the greenhouse paths get taken over, though. These are a cross-bred chioggia/three root Grex beet, quite sweet, so quite welcome. 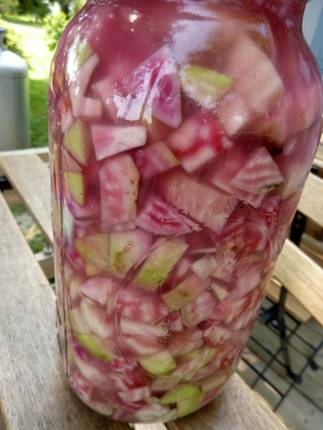 The jar on the right are pickled. I treat this as a perennial greenhouse crop, and pick them all summer and winter. regular old celery, and… Par-Cel cutting celery. I guess the answer to all this is, you want more time? Well, hold off on weeding and eat the products of your weeds. Some of them, at least. 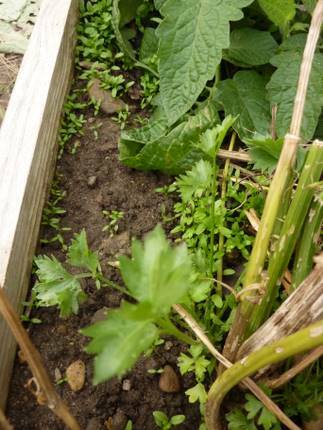 Arrgh…it is even worse when you bring the weed to the garden yourself. Got 5 huge truckloads of chipped wood when the county was trimming trees. Seemed like a blessing at the time but it brought with it bindweed and our garden is slowly being devoured by the stuff. Really don’t know what to do organically and pulling it just breaks off pieces to reseed. Great article! 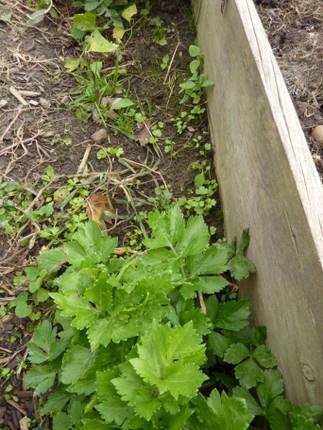 A weed I did not expect in my garden beds is the strawberry! I’m finding thriving strawberries in places where they definitely could not have gotten on their own. My assumption is that the seeds must pass through birds and land where they will and just take off. I have 2 “boughten weeds” in my garden: borage and tomatillo. I bought the borage as a tomato companion plant, and the tomatillo ’cause I made chilli verde and liked it. Never expected them to take off like they did. Two years ago I planted corn and only got the dubious pleasure of watching fat squirrels and local pheasant eat it up. The following year I did see 2 stray stalks growning along the fence, but the lawn man I hired to help me tackle and overgrown grapevine and mulberry tree grove cut down anything that didn’t look like grass. I knew about peppermint, and keep it in a hanging basket on the backporch. So far, no mint in the yard. I’m tempted to plant chocolate mint along the front walkway… Just so it smells like peppermint patties when I mow the grass! @JoAnna: I can attest to the power of tomatillo. I raised two pigs this year, and one of my favorite parts of having them was being able to feed them garden leftovers instead of composting them. Well, the pigs had been in the freezer for weeks when I noticed new plants popping up in the wallow they had made. Cucumber and tomatillo! The cucumbers didn’t really produce much by way of fruit, but the tomatillos are cruising along merrily. And, sheesh, in my actual garden beds, I have literally hundreds of tomatillo and tomato plants springing up. I started pulling them at first, but soon realized that it was hopeless to try to keep up. I take solace in the knowledge that, come winter, they’ll probably all die anyway. For all the work I put into starting and transplanting tomatoes in the spring, to see them popping up like weeds was really ironic. El, what a splendid cast of volunteers you have! No way would I call those weeds. For me every year it’s purple mustard, arugula. Last year brought a bumper crop of squash from the compost pile. Tomatoes are always sprouting somewhere unintended, and I usually give them a chance, though they rarely do much–though this year one of my most productive tomato plants was a green zebra volunteer, still giving as we stare down November. Some volunteer/weed dynamics are puzzling. Like, I usually wind up with an absolute jungle of dill seedlings that wind up acquiring weed status; this year, scarcely a one, and I scavenge desperately for a few sprigs to flavor pickles or gravlax…. Delightful post. And I just wish I could get mache to grow by whatever means. Oh, and I took your advice on having hots on a cold salad. We cooked up some beets and dumped them into our salad last night…it was very good. I’ll have to try the hot dressing next. 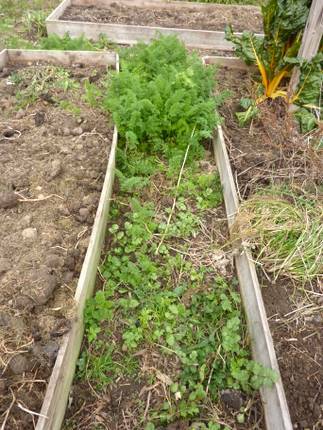 For some reason, the chervil isn’t coming back. The mâche and claytonia do, though. I let some strawberries get into the paths, and all sorts of encroachers hid under them. No more. The paths are mine, at least for now. Winecap-inoculated wood chips? That’s another story. I had volunteer melons covering the manure pile this year. That would probably be a disgusting thought to most; I found it delightful. well, this is like a theme on garden b’s i’m reading right now. yes, “weeds” have value. if i may do shorthand, but you know: think like a native american, yo. it’s a good time to learn how to do that. JCC, strawberries definitely are not a bad thing. You’re reminding me I need to uproot and replant mine; need to do that every 2nd year or all you get is baby plants and not fruit. Gotta scare them into fruiting! Next year, shortcake? JoAnna, beware the mint! Yikes. My mom bought some chocolate mint for me a few years back and I thought, heck, I will just stick it in a tiny plot near the back door for the same reason you did…but it’s now everywhere. Luckily, the bunnies love mint so I uproot handfuls, roots and all and it gets eaten. Revenge. Joshua, I feel your pain! (Yeah I am hoping to get pigs one day…I loves me some piggy, much moreso than the 30 chickens in the freezer) Tomatillos don’t readily re-seed but every single weed in a couple of the greenhouse beds is indeed a tomato seedling right now. Oh well. The frost will level them, I take heart in that fact. Brett, I would think mache would do wonderfully up thar by you. 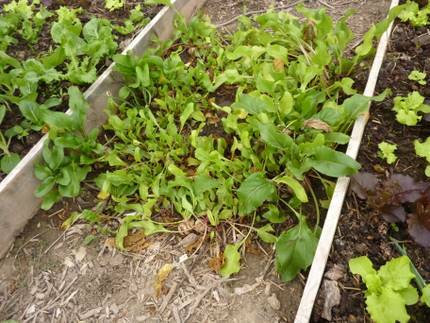 I had wild arugula (the thin-leaved, yellow-flowered kind) in my Mpls garden and I loved it but wow it did take over!! And yeah, things like the chervil and the dill (and cilantro too but somehow my cilantro plants make it through the winter) are true biennials so…if they do get a chance to go to seed by making it through the winter you are guaranteed to get a crop. Dill isn’t terribly reliable, timing-wise, for me either so I find I do need to plant it every single year. Mike, I will tell you one of my favorite lunches is hot lentils atop a cold leafy spinach/mache salad. Bonus with crumbled feta on top. Yeah, most of those biennials will shoot into flower once chilled, the wimps. I am thinking of every single one of my pac choy that I tenderly tucked into the greenhouse beds: not early enough, obviously, as they’re all blasting into flower when we got frost in the beginning of Oct. Sigh. Gotta eat ’em up I guess. I’m telling you, Peter, “good” weeds in the paths are a slippery slope you might not want to slide down. All kinds of mischief might ensue. I wish I knew how to make that little thing above your mache’s “a” though! And yeah, I have not ventured into fungi yet…I used to have a PA source for dried crimini, so of course I think: how hard can that be? Pamela, my most tasty cantaloupe ever came from a poop pile. It makes me smile. Chidy, indeed: time to start socking things away, definitely. Actually all I was trying to do was find more time to do the things I actually need to do!